The KC-97 evolved from the very successful Boeing B-377 airliner and U.S. Air Force C-97 transport. The KC-97 was adapted to carry fuel for airborne refueling of United States Air Force aircraft starting in the late 1940’s. The KC-97 served well into the 1970’s with Air National Guard units. This latest release of the KC-97 is the last operational version of the tanker. New tooling adds new out-board jet engines that improved speed and load carrying capacity to extend the useful life of the KC-97. 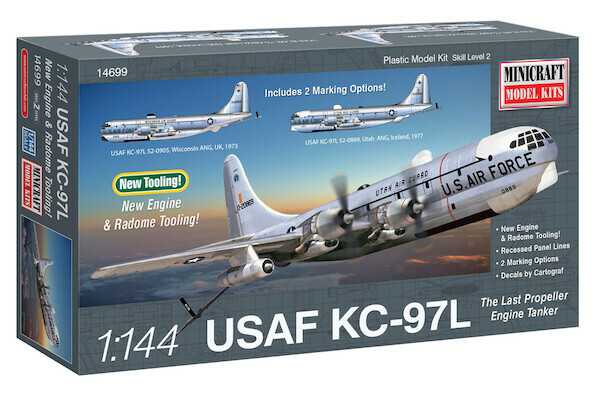 This new kit features new tooling for outboard jet engines representing the KC-97L with markings for 2 aircraft serving the Strategic Air Command. Kit includes 66 parts molded in gray plastic, 2 clear, Assembly Manual, and premium decals by Cartograf..